Blister Prevention for Running, Hiking, Walking and More! Before you put on shoes, to help prevent blisters and raw skin caused by rubbing. Use daily for effective and long lasting protection of toes and feet, even in demanding conditions. Infused with Vitamin A and C to help soften skin and restore dry, chapped, and chafed feet. Helps minimize inflammation. Apply directly from the stick. Never wet or greasy. No petroleum, lanolin or mineral oils. Footwear safe. Keeps pores clog free. Sweat escapes and lets skin breathe. Footwear safe. I walked the Camino De Santiago and completed 230 miles blister free! I owe it all to this product and I recommend spreading it on my feet twice a day during my trip. I highly recommend! I can not say how much I like this product. I don’t like to wear socks but love to walk. Usually end up with blisters and end up with bandaids all over my feet. This product is amazing. I intentionally tried it out on a pair of shoes that I knew rubbed in on spot. Walked 2 miles before I started to feel it. Back to buy a travel size so I can reapply. Thank you for giving me the freedom of walking again. Without a doubt this is the best foot product I have ever used. That little purple roll on saved my feet. I recently spent 15 days on El Camino. I was concerned about blisters as I have never hiked without developing any. I had NO blisters during the entire time. Several in my group were not so fortunate. Thank you for such a great product. I have recommended Foot to family and friends. I was having a lot of ongoing trouble with blisters in 2 spots on my right foot when I work out. I tried Vaseline, seamless socks, band-aids – pretty much everything and nothing worked. The blisters would heal and new ones would develop. I’m so glad I found Body Glide Foot! It has made such a difference – I apply it before getting ready for the gym or walk and have no irritation or blisters. I am so glad I thought to check out this product. I recently came back from a pilgrimage in Spain (The Way of Saint James) where I’ve walked 900 km (560 miles) in 30 days. I have used your product every day (which when I got it seemed too small and I thought it wouldn’t be suffiecient, but I even had some left after 30 days). I will use your product forever and reccomend it to EVERYONE!!! Down side is that I’m from Croatia and it can’t be bought here so I had my friend from the States bring it to me and I’ll have to have her bring me few sticks next come she visits. All and all BEST PRODUCT EVER!!! You don’t even feel like you have anything, it’s not greasy (like vaseline that other people used on the pilgrimage), you need to apply only a small amount…just perfect!!! Ideal for work, play, travel, and nights out when you don’t want to risk blisters. 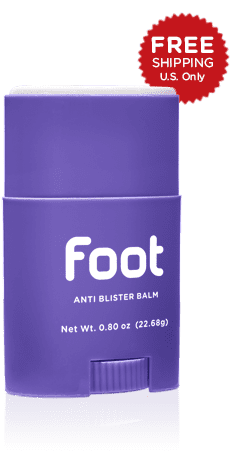 Use Body Glide Foot balm for rubbing that causes painful irritation, chafing, hot spots under feet, blisters, or raw skin. It’s invisible and comfortable, like it’s not even there. For external use only on intact skin. Keep out of the reach of children. When using this product, do not get into eyes. Stop use and ask a doctor if condition worsens, symptoms last more than 7 days or clear up and occur again within a few days. Do not use on deep or puncture wounds, animal bites, serious burns. If swallowed, get medical help or contact Poison Control Center right away. Store at 59 – 86 F (15 – 30 C). May stain some fabrics.